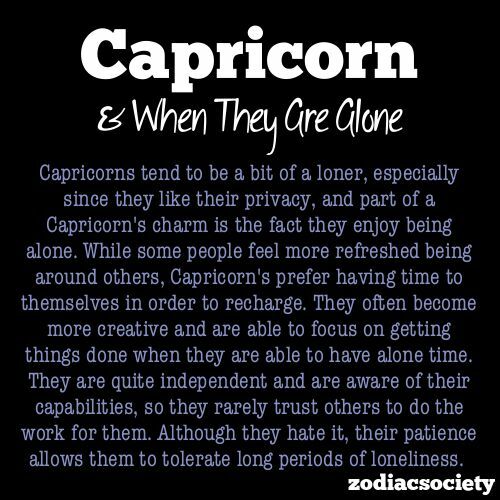 Capricorn When They Are Alone | Capricorn Life - Capricorns Rock! Capricorns tend to be a bit of a loner, especially since they like their privacy, and part of a Capricorn's charm is the fact they enjoy being alone. While some people feel more refreshed being around others, Capricorns prefer having time to themselves in order to recharge. They often become more creative and are able to focus on getting things done when they are able to have alone time. They are quite independent and are aware of their capabilities, so they rarely trust others to do the work for them. Although they hate it, their patience allows them to tolerate long periods of loneliness.